Every last one of these is on my TBR list. Ha! We have similar reading taste! I have The Husband on my TBR list! I’ve read – and loved – Kara Thomas’ first two books, so I NEED to get my hands on The Cheerleaders. I also really want to read Daisy Jones. ok, you’ve sold me on the cheerleaders. adding it to my list. glad you liked Daisy Jones! so good. I need more from TJR. I need to add all of the others (besides Daisy Jones since I’ve read it) to my list!! I’m planning to read Daisy this month. So looking forward to it but I worry that I’ve over-hyped it in my head. No book should have to live up to unreasonable expectations! 😀 It’s Always the Husband sounds very intriguing. I love being right about whodunit or what’s going on, but I also love being absolutely wrong and 100% surprised by an ending (unless it’s stupid, then I throw things). I reluctantly have the Cheerleaders on my TBR because well, my daughter is one and I always get worried and also very annoyed at how they’re portrayed. But we have similar taste so I trust your review. And Daisy was just a spectacular book. I haven’t read any of these books, but they were all already on my to read list! I’m actually waiting for Daisy Jones to come in from the library. Glad to hear you enjoyed them all! 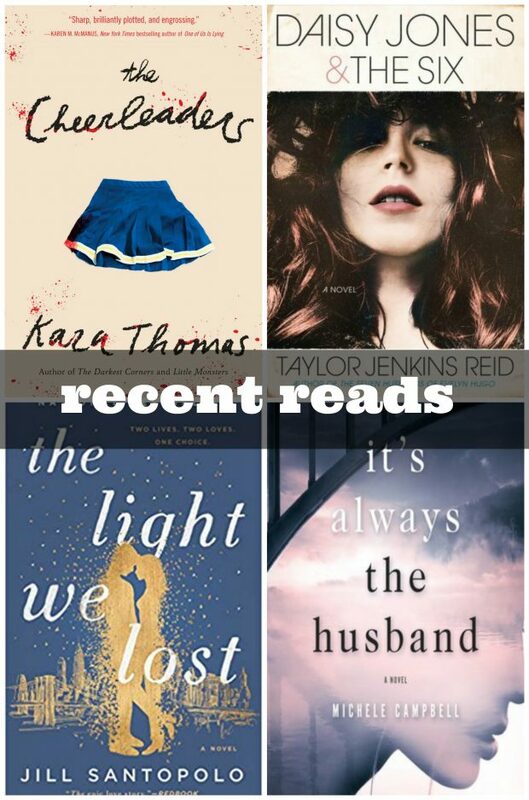 I want to read all of these! I’m on the waiting list for Daisy Jones at the library but I wasn’t as fast as you…there are 108 people ahead of me!! LOL! I might just buy it! I thought daisy was just ok. Everyone had read it so I had high expectations and honestly it wasnt as high as it was made out to be. Your other books are all on my to read list! DJ&T6 was SO GOOD!! Loved the format. These are basically all books I want to read!